This audiobook is the critically acclaimed novel by English writer Edgar Wallace, the co-creator of King Kong, who died in 1932. In an understated yet effective performance, Bill Homewood brings Wallace's work to life. The second novel in the Four Just Men series focuses on four anarchists who believe they are above the law as they protect society. They kill for a greater cause - that of justice. The story is more complex and more intellectual than many contemporary novels, yet Homewood's methodical style and measured tone help make the dialogue accessible. His narration allows listeners to focus on why four men believe their perspective is more accurate than everyone else's. An excellent introduction to this master writer. 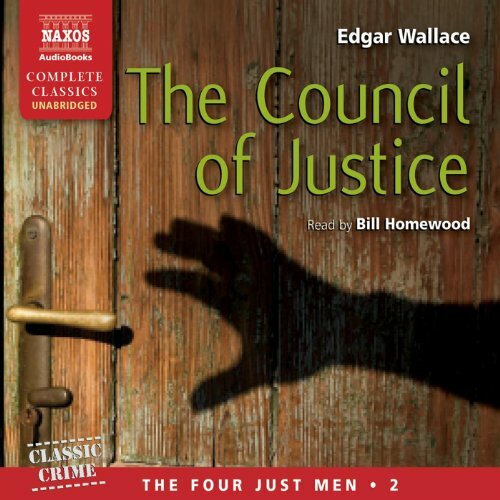 In his Four Just Men series, Edgar Wallace comes up with something different: the ‘villains’ are not necessarily bad people, and the pursuers of justice, the Four Just Men, as they call themselves, are acting outside the law. They argue that their actions are for the public good, and dispassionately eke the ultimate revenge — death — on their victims. In their turn, the Four Just Men are pursued by the police, but somehow remain our heroes. The Four Just Men, in this second of Wallace’s ingenious series of thrillers, pit themselves against The Red Hundred, an organisation dedicated to international anarchy, led by the charismatic and beautiful assassin, the Woman of Gratz. As always, the avengers’ methods are meticulously planned and ruthlessly executed.